Hi there! Today, we discuss about the Trans-Neptunian Objects, and more precisely objects orbiting in the Kuiper Belt, i.e. between the orbit of Neptune (~30 astronomical units) and ~50 AU (remember: the Earth orbits at 1 AU, i.e. 150 millions kilometers) for the classical Belt. Scattered objects orbit beyond that limit. During six decades, Pluto was the only known object of them, but the observation surveys with large telescope and adaptive optics has permitted the discovery of more than 100,000 of them! And among them are what we call dwarf planets, i.e. bodies which are large enough to have a pretty spherical shape. Beside this, many Kuiper Belt objects have a companion, i.e. a satellite. When the satellite is large enough to compete with the primary body, the system is called a binary. Today, we focus on the satellites of 2 large TNOs, named Eris and Orcus. The study I present, Medium-sized satellites of large Kuiper belt objects, by Michael E. Brown and Bryan J. Butler, tells us that their known satellites are pretty large and dark. This study has recently been published in The Astronomical Journal. Charon, i.e. the companion of Pluto, has been discovered in 1978. At that time, Pluto was the only known Trans-Neptunian Object. Since then, the discoveries of TNOs were often followed by the detection of a companion. There could be more than 20% of binary objects and multiple systems in the low-inclination populations, i.e. the objects which orbital plane is close to the mean one of the classical Kuiper Belt. This fraction seems to be much smaller (maybe 5%) for the inclined objects. But determining a frequency is a tough task, since the detection of such objects challenges the limitations of our observation facilities. Anyway, there are many binaries among the Kuiper Belt, and this raises the question: how is that possible? How did they form? Does the companion result from an impact? Was it a single object, which have been trapped by the primary one? Answering these questions requires to consider the properties of the two objects, i.e. their mass ratio, their distance, their composition (do they appear to be similar or not?). And this also raises other questions, related to the stability of these systems (how long can they survive as binaries)? 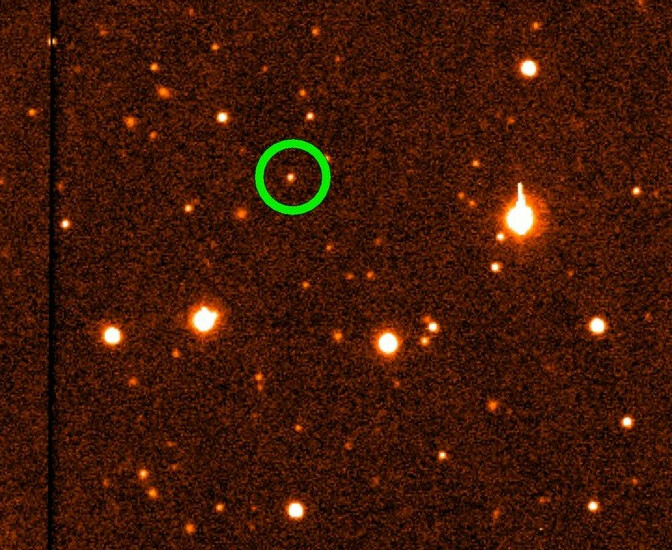 Eris and Orcus were discovered in 2005 and 2004, respectively, by a team led by Michael Brown, with data from Palomar Observatory. The discovery of a Solar System object usually happens during a systematic survey of the sky. You take several pictures of a given field of the sky. You first need to reduce them, i.e. you de-noise them to correct for the instrumental and atmospheric problems, then you make an astrometric correction in using the stars which appear on the image, to improve the reliability of the coordinates you use. Once this is done, you see small points on the images. From an image to another, most of the points are fixed. These are the stars. And sometimes, a point is slowly moving. This is a Solar System object. And if this object is not catalogued, it means you have discovered it. Actually it is a little more complicated than that, you need to re-observe the object to validate the discovery and calculate orbital elements, i.e. determine its orbit. But once an object is observed, it is easier to re-observe it. And the multiple observations of Eris and Orcus have permitted to infer some of their physical properties, and along with their orbital elements. Interestingly, there were precoveries of Eris and Orcus. A precovery is an a posteriori identification of an object, after it is known, but on images taken before its discovery. In other words, its presence was on the images, but remained unnoticed. Precovery images have been identified back to September 3, 1954 for Eris, and to November 8, 1951 for Orcus. This means that we have observations over more than 60 years. Of course, these precoveries do not give us any clue on the physics of the object. However, they constrain its motion. If we consider the fact that its period is of the order of a few century, an observation arc of 60 years is highly valuable for determining its orbit. You can find below some of their properties. And it appears that these two objects are indeed very different. Orcus is a plutino, i.e. its orbit is close to the one of Pluto. It is in a 3:2 mean-motion resonance (MMR) with Neptune, i.e. it makes exactly 2 orbital revolutions around the Sun while Neptune makes 3. However, Eris is a scattered object. This means that its orbit does not make it a cold (i.e. unexcited) classical Kuiper Belt object, but it belongs to the objects, which have been somehow dynamically excited. As a consequence, its orbit is significantly inclined with respect to the classical Kuiper Belt, and it orbits far beyond. And these two bodies appear to have at least one satellite each! Both were discovered in 2005 by teams led by Michael Brown, during observations of the main Kuiper Belt Objects. The satellite of Eris, Dysnomia, has been discovered thanks to the Keck Observatory, located on the Mauna Kea, Hawaii, while the satellite of Orcus, Vanth, was discovered thanks to the Hubble Space Telescope. These objects appear so faint that we must use the best facilities to study them. The authors used data taken at the Atacama Large Millimeter Array (ALMA). This is an array made with a collection of 12m-antennae, in the Chilean Andes. They benefited from a recent upgrade of the instrument, to obtain spatial resolutions of 10s of milliarcseconds. Observations at this resolution at the frequency of 350 GHz, which is at the boundary between far infrared and sub-millimetric, permits to directly measure the thermal emission of satellites of Kuiper Belt Objects. You can find in the video below some views of ALMA. The authors disposed of 4 ALMA observations of the pair Orcus-Vanth, taken in October and November 2016, and 3 observations of Eris-Dysnomia, made in November and December 2015. The four observations of Orcus-Vanth gave an obvious resolution of the two bodies, while it is not that clear for Eris-Dysnomia. A combination of the 3 observations into a single image has anyway allowed a detection with a very good confidence, and using an a priori knowledge of the location of Dysnomia, due to previous studies. The authors also supplemented their Orcus-Vanth dataset with unresolved data (i.e. on which you cannot separate the two objects) due to the infrared Spitzer Space Telescope and the Herschel Space Observatory. Once they have these data, they should invert them to extract physical parameters. And this is not easy. The difficulty comes from the accuracy of the observations. Remember that each of them is indeed a challenge. If all of the observations had a perfect accuracy, you would just need a few images to get the position of the velocity of a planetary body, and then its orbital elements… But, if you try to do that on two different datasets related to the same object, you would get different numbers! And the reason is in the accuracy of the observations. Just an example: in using an orbital solution for Vanth resulting from a previous study, the authors got a difference of 11° in the longitude, i.e. Vanth is 11° in advance on its orbit on these observations, with respect to the predictions, which are derived from previous observations. This should give you an idea of the difficulty of the task. And the authors should find a best fit between the models and the observations. They model Eris, Dysnomia, Orcus and Vanth as spherical bodies, which have an orbital motion and a thermal emission. These things depend on parameters, and you should find the numbers for these parameters, which give the best match between observations and models. For that, they used the Markov Chain Monte Carlo scheme. This consists in testing a collection of parameters, which are distributed following a probability law. You can find below some of the results. they are much darker than their parent body (Eris for Dysnomia, Orcus for Vanth). This last element suggests that they have a different composition. On the origin of the satellites: impact of trapping? An elegant scenario for the creation of a double system is an impact on the proto-primary body. This impact would have excavated a significant mass, which would have then formed the secondary. This is the most popular explanation for the formation of the Moon, and this seems to work for Pluto-Charon. But the difference in albedo between the primary and the secondary, for these two pairs, could rule out this scenario, just because the surfaces seem to be too different. This could also mean that the secondary is essentially made of material, which initially belonged to the impactor. But this enforces another scenario as well, which is the trapping of the secondary by the binary. Originally there would have been two independent bodies, which would have met, and got gravitationally bound. Why not? That would be consistent with a difference in the composition. You can find the study here. The authors made it freely available on arXiv, thanks to them for sharing! The homepage of Michael E. Brown. He discovered several Trans-Neptunian Objects, including Eris and Orcus, and is strongly involved in the quest for the Planet Nine. You cann see his blog here. and the one of Bryan J. Butler.